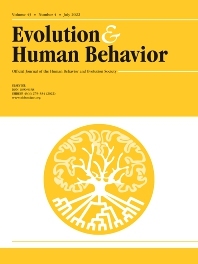 Evolution and Human Behavior is an interdisciplinary journal, presenting research reports and theory in which evolutionary perspectives are brought to bear on the study of human behavior. It is primarily a scientific journal, but submissions from scholars in the humanities are also encouraged. Papers reporting on theoretical and empirical work on other species will be welcome if their relevance to the human animal is apparent.